Mariposa's Tales MARIPOSA'S TALES: My Food for Life?! Is it still Monday? I'm glad to most yes! Because I am sooo running late with my FUN Monday! Fun Monday host for this week is M at M for Misanthrope and she wants to talk about FOOD! If you could choose one “main course” item and one dessert item that would, just for you, contain zero calories for the rest of your life (or zero cholesterol, zero points, or whatever your most important dietary measure is)…what would you choose? Post a pic of your chosen items if you like, or just make us drool with a description! And I'm referring to sushi and sashimi! And did somebody just mentioned dessert?! 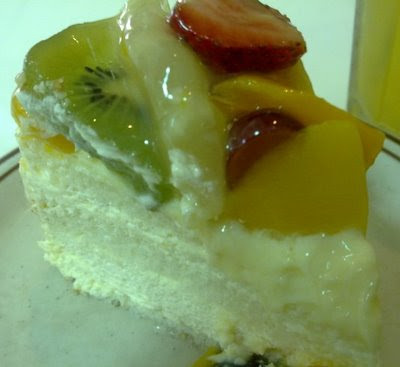 Well my latest obssession at Dessert Factory, Piñacolada Cake! My gosh, that cake looks tremendous. Thanks. We have this excellent fresh market that makes sushi on the premises. I must try it. Can't believe that in all my years I haven't. The freshness and beauty of the way the food is arranged is so artistic and so unlike what I would normally have. BTW, such good news about your travel plans for August. Half the fun of traveling is in the planning. I hope you all get to experience so many unusual things. I have a feeling we have similar tastes in food, Mariposa!